Fourteen volunteers showed up early the hot morning of Sat Jul 28th, for the “Emergency Quick & Dirty Litter Pickup Team”. They are, starting left, Mike Pudlo, Adopt-a-Highway Co-Chairman, Lohn Zylicz, Tim Logan, Juan Chapa, Pat Nagler, Cole Nagler, Lynette Nagler, Jim Cooper, and FOR President Mike Goodson. Not pictured is Tom Ronayne, Adopt-a-Highway Co-Chairman, Vicki Head, Cathy McDonald and Rachael Strange. 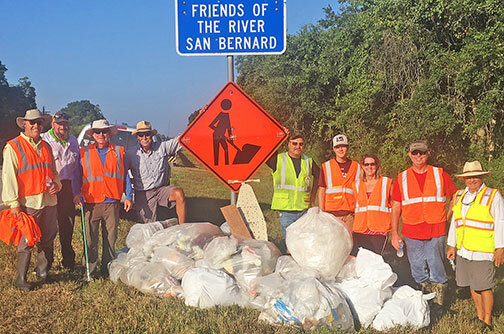 San Bernard River residents should be very proud of the work the FOR Adopt-a-Highway volunteers completed this morning on the two mile stretch of roadside before and after the Churchill Bridge. After a recent mowing, the area looked like a litter bomb had exploded and covered the area with trash. It is now amazingly clean after 24 bags of trash collected. Thanks to all who participated for a very successful day on very short notice. This meaningful activity helped clear the roadside and prevented the trash from polluting the river.